Trau Nam Cape is nearly 40 kilometers away from Duong Dong town’s center. 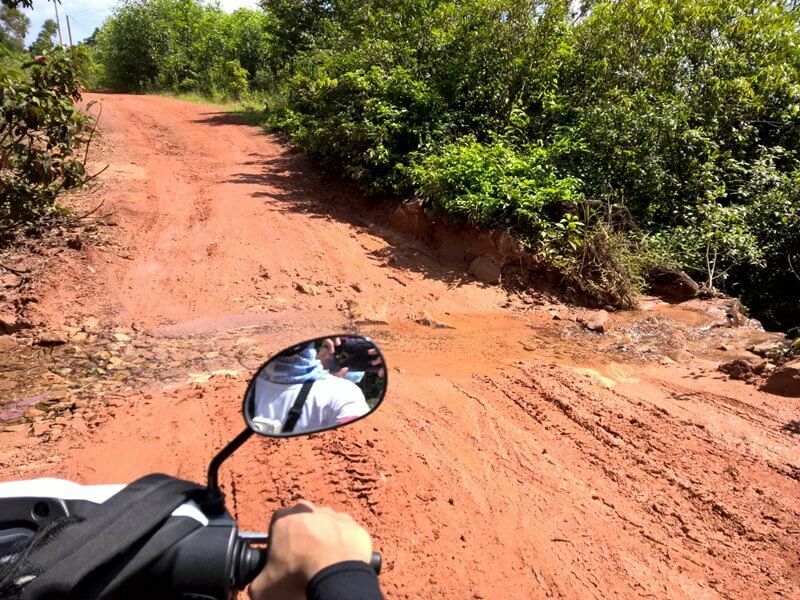 To get to Trau Nam Cape, you will need to travel 30 kilometers from Duong Dong town to Rach Tram crossroad, 8 more kilometers on red-soil TL49 road with mud sinks, potholes to Rach Tram fishing hamlet. 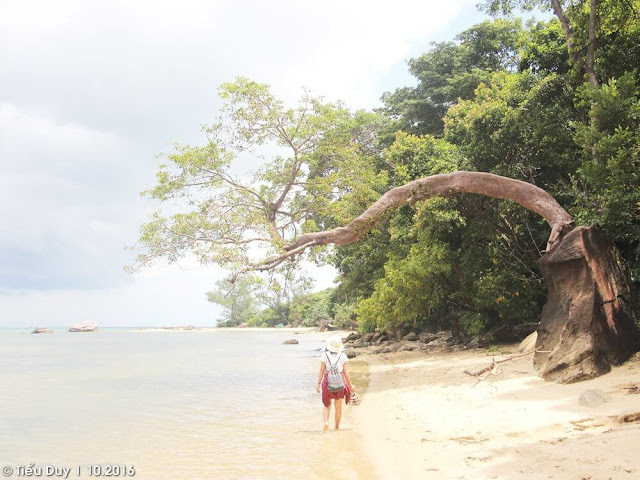 Next is 2 kilometers through quicksand road and 1 kilometers trekking along the coastline, swimming through a small river then you arrive at the cape. The route may sound difficult; however, the sights along the route will help you forget all the difficulties you have gone through. The Northern island area is Phu Quoc’s primal forest Preservation Zone, so as you walk on the island, it will be quite a surprise to see only the surrounding trees. It is the reason why the North Pole journey will become truly special. The great trees with their roots firmly dig into the ground, the orchid flowers right in reach, and palm trees lines with cool wind, and more… are what you will encounter on this route. Even if traveling during the rain season, the beach here still wears the distinct blue color with white sand, making it looks unbelievable. 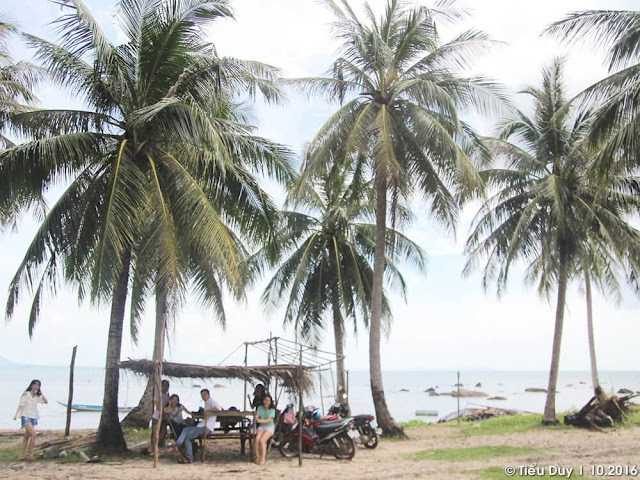 According to the locals, Phu Quoc has only two white-sand beaches: Star Beach and Trau Nam Cape’s beach. Especially while walking along beach to the North Pole, you can spot a tree grows upon a rock, which leans toward the sea. It is surely an opportunity for photographing. 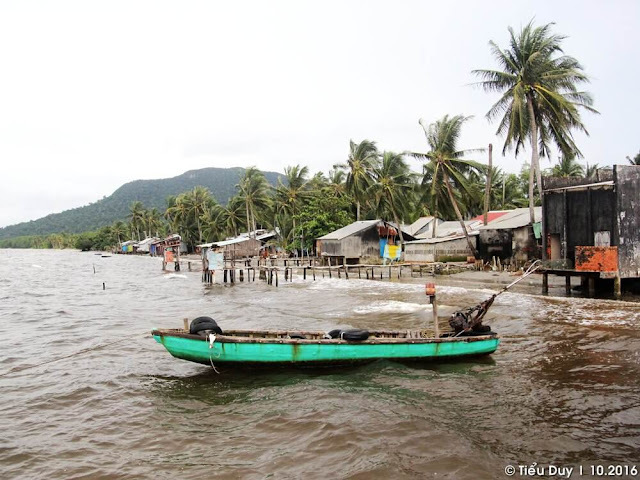 Lies within the farthest part to the North of Phu Quoc Island, Rach Tram fishing hamlet looks like isolated from the outside world. In the past, the transportation system on the island was not developed. The fastest way to get to Rach Tram is through ship. If not, you will be lost within the sand and jungle labyrinth. 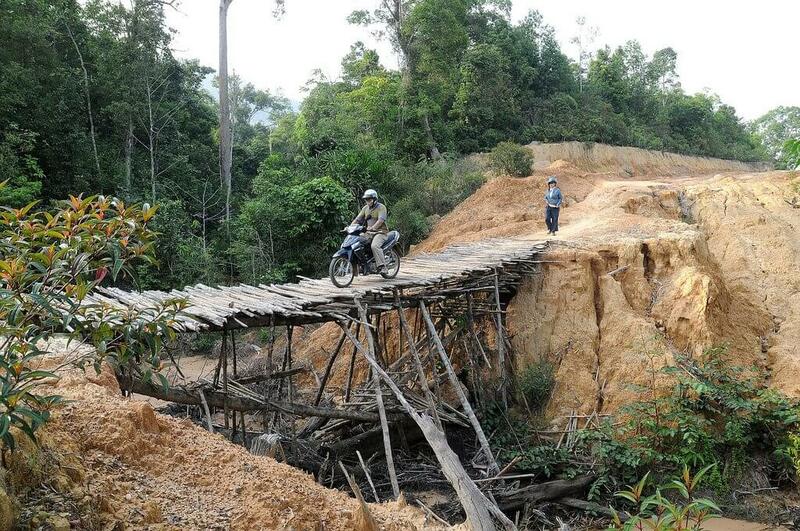 Although the path is clearer nowadays, it is not recommended for all riders. 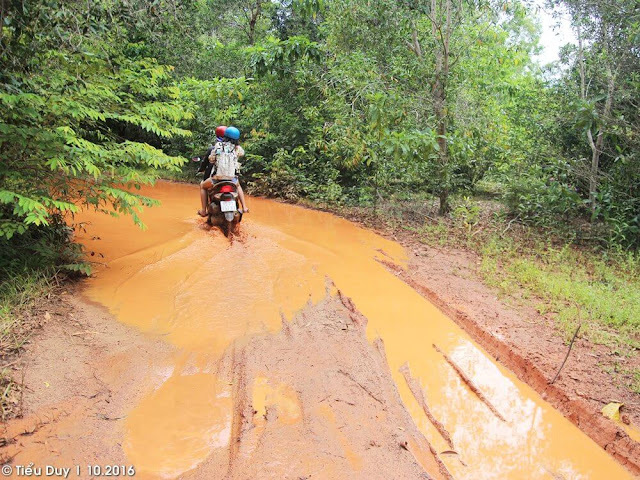 Not to mention that during the rain, the road into Rach Tram will become a ‘mud river’, which is extremely difficult to move on. That being said, Rach Tram fishing hamlet is still be able to keep its own primal aspect. Rach Tram Beach is not clear like many other places due to the mud layer from the forest flows under the sand layer. There aren’t much floating-houses neither. The locals’ main work is to go fishing afar. Even so, you can buy seafoods such as crabs, squids, shrimps with much cheaper price than Rach Vem or Ham Ninh. What can be better than lying on the hammock and listening to the sea after a seafoods feast? Ham Ninh fishing hamlet lies on the beach within the Eastern part of the island, the back is forest, and the front is sea. When the sea level is low, the enormous sandbank spreads far and wide toward the sea. Whereas the sea level is high, the water can cover even to the forest block. The first impression when stepping on to this land is that you can see the Ham Ninh mount with 300 meter-height. Rocks on top of rocks with reeds cover the surface creates an fog area blands in the midst of green color of the mountain and great sea of Phu Quoc. If you’ve already came here once, you can’t possibly forget Ham Ninh’s blue crabs, famous for their fresh meat. Truly a pleasant feeling enjoying these steamed crabs while watching Ham Ninh beach under the glorious sunlight. The path from Ham Ninh to Bai Thom, circle around Rach Vem village is approximately 60 kilometers long. In which 30 kilometers walking through the forest from Ham Ninh to Bai Thom is the most memorable experience. It takes 2 hours to get through this path due to many holes and rivers along the way. Because of its muddy terrain when raining, at some shallow spots, the locals have to put the tree trunks next to each other to form a path. Not to mention at some large rivers you encounter, the locals have to create bridges. These bridges feel like they can only sustain one car, and they will be broken with only one more person on them. While approaching Thạnh Thoi ferry, you will see an intersection. Going straight leads to Bai Thom, turning right leads to ferry, and turning left leads to Quoc Phong way. This is like a ‘hot area’ where many wild animals gather, and from here visitors have higher chance to spot mammals than any other places. The path through forest is rough, but easy to navigate. It is 20 kilometers long with the way out leads back to Duong Dong town. As hard as it may sound, after getting through you will have a satisfying feeling. It likes winning a tough battle against the nature. You can take a rest at Bai Thom, where many seafood restaurants reside. If possible, you can discover Hon Mot nearby – an aquatica territory – a small paradise which receives not much visits. From here, the path through the forest was nicely asphalted and easy to run upon. 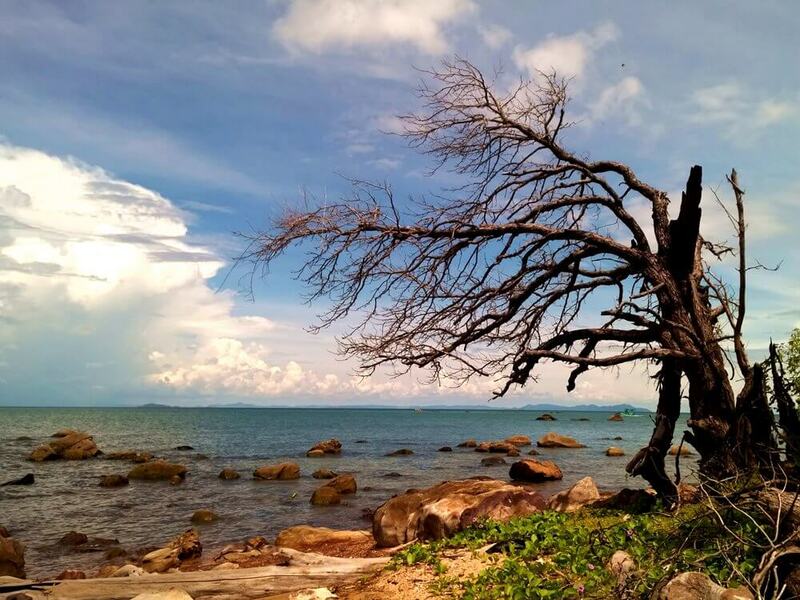 That said, you can still watch the great tree trunks of Phu Quoc forest from both sides of the path. This is the main road which leads you to Rach Tram, Rach Vem fishing hamlet, Ganh Dau Cape or returning to Duong Dong town.